Was Something Other Than Planning Going On? . . . Per Today's OD: New Hartford growth plan on life support - Majority of Town Board against 5-acre lot proposal. After almost three years and $355,000 spent, the town might walk away from a study outlining growth patterns for the southern portion of New Hartford. . . .
. . . But at least three members have already come out against its key proposal: a 5-acre average lot size. “To do nothing would be an example of government ineptness and a monumental waste of town and county tax dollars,” he said. Oneida County paid $150,000 of the cost of the study, Donovan said. feels it was left out of the planning process (i.e., not merely invited to chime agreement with the consultants and/or their handlers) then the study may be considered not "legitimate." "Legitimacy" can also be a matter of "truth in labeling." The "Generic Environmental Impact Statement" looked more like a proposed land use plan than a determination of environmental impacts. Usually a plan comes first, then an impact statement -- not both at the same time. This begs the question: Where is the "Design Plan" for the southern area? Reading the document (and there not being a separate document labeled "Design Plan") makes it clear that what is labeled the GEIS is the Design Plan. But with two different concepts (a plan vs an impact statement) combined in one document, it is confusing for the public when they are invited to comment. Are they supposed to comment on environmental impacts? Or on the elements of the design? This begs the question: Who decided that development was to be concentrated in the hamlets? Was it the consultant? Or was it some town official who thought it might be a good idea? I don't necessarily disagree with this idea, but it is disingenuous to go through a public meeting process to give an impression that this idea came from or was supported by the public. But the process did seem disingenuous. . . . The Stormwater Group never made a determination of the "best way" to manage anything. 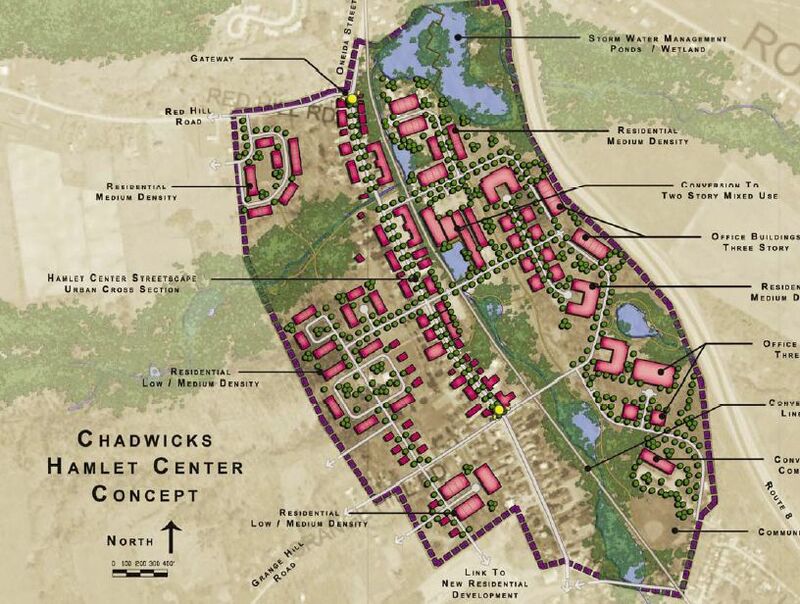 The 5-acre requirement was another one of those ideas that was pre-conceived, presented, and reacted-to by the group, with the reaction somehow morphing in the GEIS into a determination that this was the "best way" without the group being offered alternatives. As far as the "sound" recommendations mentioned by the former Planning Board Chairman, let's get back to the OD article and focus on that 5-acre proposal since that is what has generated the most opposition and is an example of why this plan must be rejected.
. . . many residents had said they wanted the town to solve the stormwater runoff problems that were plaguing their neighborhoods. The 5-acre plan would prevent the problem from getting worse, Donovan said. How so? You don't have to be an environmental scientist to know that five acre lawns will generate a lot more runoff if they replace 5 acres of woodland. . . .many residents said they wanted to preserve the rural character of the southern part of the town. 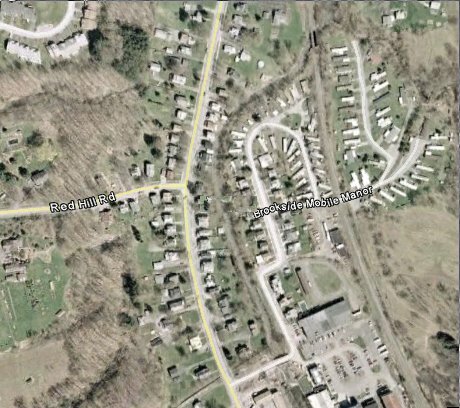 Residents were worried that large subdivisions could burden town roads and reduce open space in New Hartford. Donovan points to that finding as a key impetus for the 5-acre plan. But zoning an area as agricultural would do a much better job of preserving the town's rural character than a 5-acre rule. Manicured lawns don't look like rural fields. If subdivisions are limited to 5 acre lots, isn't that what Wikipedia would call "exclusionary zoning?" . . .i.e., "measures that appear to impose unnecessary or unjustifiable costs or requirements facially or by execution excluding various groups of ‘undesirables.'" Is that what is intended here? If the 5-acre requirement does not guarantee runoff control or preservation of "rural" character, what does it guarantee? What else is in the plan? Compare the Chadwicks Hamlet "Design Concept" [Fig 2.5-11] with what is on the ground now (via Google Earth) . . . The Brookside Mobile Manor will be replaced by "Storm Water Management Ponds/Wetlands." Is this the only possible place for the pond/wetland? Is it really necessary to place a water feature where people are living? Why would the pond/wetland be needed if nearby development is properly controlled? Are the people living there asking to be moved? Or is their presence "undesirable?" The GEIS discusses the situation and how the Town should have a plan for the displaced residents . . . but will the plan be like the non-existent mitigation plans that the Town elsewhere collected Fees In Lieu of Mitigation money for? Is this the vision of the Town's residents, or only that of a selected few that controlled the process? The Town Board needs to answer that question before going any further with it. Wasting More Money . . .
Assemblyman David Townsend says schools in his district would lose 15 resource officers, and he is asking Governor Paterson to re-think his budget cuts and keep state troopers in New York's schools. Keep STATE TROOPERS in New York Schools? Doesn't Mr. Townsend know that state troopers are the creme-de-la-creme of law enforcement officers -- and command a very high salary? What is amazing is how this gig ever got started . . . Interaction among some public employee unions, perhaps? Inflating pensions with overtime, perhaps? Let the school districts contract with local police forces (at a lower cost) if need be. School districts get plenty of money from the state anyway. The Governor is correct on this one and Mr. Townsend is wrong. Troopers are paid way too much to be assigned to "interact with students." This can't be good: Empire Aero CEO resigns . Empire Aero President Brian Olsen has resigned, a spokeswoman for Empire’s parent company, IAI North America, said. . . In November, the company laid off about 88 people from its workforce . . .
Oneida County Executive Anthony Picente said he was concerned about Empire Aero’s stability because the aircraft maintenance industry was being affected by the national economic downturn. . .
Local officials have billed Empire as a key element of the rebirth of Griffiss . . .
More than $27 million in county, state and other grant money has been spent on structures now being used by Empire, he said. That's a lot to spend for one company . . .
Not mentioned is the major money spent on an MVCC aircraft maintenance training facility that is closely associated with EAC. Also not mentioned is that this is only a portion of what has been spent on an airport that is clearly too big for our needs! Even if Empire leaves, that money isn’t lost, Picente said. Yeah? HOW? . . . I see just more empty buildings that the taxpayers have to market and pay to maintain. 1/30 update: Larry Tanoury, Jr. has a lot to say about this. Looks like the MoVa isn't getting any goodies: Initial high-speed rail funding not headed Utica's way. While I'm disappointed that the MoVa didn't get a dime, getting excited over hi-speed rail is nonsense. There is no more convenient and reliable way of traveling between Upstate NY cities than the Thruway because (1) you get to leave when YOU want, not when the train is scheduled, (2) you don't have to travel to and from the station, and (3) you don't have to switch travel modes to taxi/bus/car on either end to get to your destination. Any time savings in intercity travel is easily eaten up by the less convenience. Travel to NYC by train makes sense because a car is a liability and an inconvenience on the NYC end of the trip. . . . but it is much easier to do this from Rensselaer because there are trains leaving every hour or so from there. There are only 2 or 3 a day from Utica. Do the high speed rail advocates really believe that the numbers of trains will be significantly increased? Where is the market study that demonstrates a demand? Revenue Raiser? . . . or Citizen Shakedown? It's bad enough putting up with the New Hartford Rt 840 and the New York Mills speed traps . . . but at least you are facing a human being when you are ticketed and will be informed immediately of what it was that you allegedly did wrong. You will remember exactly what you had done moments before. New York drivers might soon be among a growing group being watched -- and ticketed -- by a roadside camera system. Included last week in Gov. David Paterson’s budget proposal is a “revenue action” to deploy 50 cameras on highways to ticket speeders. . . .
How would you like to find out days later in the mail that you allegedly were speeding on such-and-such an occasion? Would you have any recollection of the event? Probably not. . . Most people are honest, and would pay a ticket if they knew they were speeding . . . but what if you really don't know? Do you assume that the government is correct and pay the ticket? Or do you fight it . . . and take the chance that you might really be wrong? Odds are you will pay the ticket even though you don't know that you had done anything wrong. This becomes a form of governmental indoctrination . . . If the government says you were wrong, you learn to accept that the government is correct. Paterson estimates the plan to fine speeders in highway work zones could generate about $174 million over the next three years. But even though the program surfaced in a budget that struggles to close a deficit, the cameras are about safety in highway work zones, not making money, state officials said. Baloney! This is New York . . .the state that harasses its citizens to the N-th degree with all sorts of taxes, tolls, and fees . . . How does the governor know that $174 million will be raised, unless that is his goal? The state worker-bees will be given their orders and will calibrate their cameras to ensure that the $174 million gets collected. Few will fight it. Safety measure? No. Citizen Shakedown? Yes. This idea needs to be stopped . . . Now! Overpaid In New Hartford . . . The Observer Dispatch asks "How much is enough?" when talking pay for New Hartford police. With new contracts pending, the taxpayers, likewise, want this question answered. The starting salary for New Hartford officers, after they have completed academy, is $41,372. In Whitestown, that number is $32,753 and in Kirkland, it’s $33,400. In Utica, officers in their first year after academy and other training get $42,647. So NH PBA president Paul Colburn argues . . .
New Hartford is the second busiest department on the area after Utica, he said, and the officers should be paid accordingly. . . .
Colburn pointed out, New Hartford has lost an officer in the line of duty, just as Utica has. When NH officers get off the 840 ticket detail and go into troubled Cornhill or West Utica, or deal with gang violence at Proctor on a daily basis, then I would agree that they should be paid at levels comparable to their Utica brothers. . . .but not until then. The notion that pay should be comparable because because both police departments have tragically lost officers is as preposterous as it is disrespectful to their memories. News accounts indicate that the Utica officer may have been specifically targeted for his police work, while the NH officer may have been in the wrong place at the wrong time due to inexperience in dealing with the type of situation. The memories of both deserve our honor . . . But the situations of the respective tragedies suggest why there should be a difference in pay scales. Utica officers are more experienced with more serious crime. Experience . . . not seat time . . . and not maintenance of a rent-a-cop company . . . is what the taxpayers should be paying for. OD Ethnic Bias? . . .
At least that is the accusation from Mayor Roefaro in today's Utica Daily News. To some extent, I agree with him. This bias comes through as an Anti-Utica Bias but sometimes is more overtly anti-Italian, as in the OD article about "snickering" over dropped vowels, and OD's seeming fixation on 50 year old "Sin City" events. And, yes, there seems to be a double standard where New Hartford is concerned (although that may finally be changing). The bias is wrong, and it hinders regional progress. That said, the Mayor cannot convincingly play the "bias" card to cover up the shenanigans over the Labella appointment. The law was violated. Several layers of government and several bureaucrats were complicit. It's important for the public to know these things and the newspaper's job to report them. There are plenty Americans of Italian descent in the Utica area that are upset over l'affaire Labella. The mayor's claim of bias to cover up his own lack of accountability is not only irresponsible but is a poor reflection on Utica and others who share his ethnic heritage. Let the Whining Begin. . .
Schools could lose millions in state aid under proposed budget. Schools should not be immune to economic misfortune. And school spending must be brought under control. Even with generous state help, school taxes, even after STAR, have increased dramatically over the years to the point where they have become confiscatory. This drives people and jobs out of New York because they can no longer afford to stay here. Today it is not uncommon for school districts to annually exact more than 2% of the value of real property in taxes -- exceeding a former constitutional limit. Money is spent not on educating students but on lavish sports facilities and school construction projects. The number of administrative positions has ballooned. Nonsense distractions like International Cup Stacking Competitions occur regularly. Busing has become the norm, wasting student time and encouraging urban sprawl. Class sizes have been reduced, requiring the hiring of more teachers to do the same job. Teacher assistants or aides have been added to the mix, further increasing the number of paychecks. There are so many school district paychecks that, in a sense, whole voting blocks have been purchased with taxpayer funds, skewing elections and local policy making toward more government (leaving less for private business). Teacher pay has increased over the past generation at up to twice the rate of other comparably educated public employees with no increase in responsibilities. It has gone on long enough. Whitestown Residents Paying for New Hartford's Sewers? That would seem to be the case based upon this County handout from a Town of New Hartford meeting last week and the per-capita breakdown of sewer repair costs presented here last month. The handout was made to convince the New Hartford Town Board to sign on to the County's plan. New Hartford is the sole holdout at this point. What Oneida County is proposing is unusual. It will collect money ($1.05/1,000 gallons of water used) from all sewer users tributary to the Sauquoit Creek pump station, and then use the money to make selective repairs to sewer systems owned by individual suburban municipalities based on what would be of greatest benefit to the County in fulfilling its obligations under the DEC Consent Order. So money collected from, e.g., Whitestown residents could be used to fix sewers owned by the Town of New Hartford. Whitestown is mentioned here because per-capita its costs ($424) are the least of all the municipalities affected, are clearly less than New Hartford ($1233), yet the Whitestown Town Board has apparently already signed on to this plan. It is unknown what information was presented to the Whitestown board, what, if any, alternatives the board explored for funding repairs to its sewers, and whether the board might have felt pressured by the County and the mention of potential fines of $37,500 per day. All too often members of governing bodies are given partial facts, partial options, told that they must act NOW or the sky will fall, and wind up rubber-stamping a scheme cooked up by "powers that be" that might not be in the best interests of the people that they represent. Here is where a vigilant press is important, but Whitestown, even though it is almost as large as New Hartford in population, gets virtually no coverage. With simply too many governments for one newspaper to cover, Whitestown residents are left in the dark. To be sure, the handout indicates that the dollar amount to be collected from the Town (in this case New Hartford) will not exceed the principal and interest needed to fix its own sewers plus its share of system improvements. Presumably it is supposed to be the same for Whitestown. But how will this be accomplished? Will Whitestown residents simply stop seeing charges on their water bills when their per capita share of principal and interest has been exceeded? Who will keep track of all this? Does the County have an incentive to do so? In spite of all the information on the County website, there is no model agreement between a municipality and the county specifying how everything will work. Amazingly, Towns and Villages have apparently authorized the County to place fees on their residents with no written agreements specifying how the County will apply the fees, how the fees will be accounted for, when the fees will stop, etc. The County seems to be saying "Trust us" to do the right thing . . . but with no intermunicipal agreements being voted upon there is nothing for a Town or Village to enforce against the county, to ensure that the county treats residents fairly. New Hartford balks on sewer fee - Other options sought to pay for state-mandated repairs. New Hartford is exercising "due diligence" by considering other options, rather than being railroaded into accepting the County's solution. Bravo. Protecting Privacy . . . or Covering Up Malfeasance? This little article caught my eye: School district denies request to release video. The OD is trying to view the video of a school bus driver allegedly dropping a student off at the wrong house. In a letter to the O-D, the district indicated that it believes releasing the video of 11-year-old Michael Polak Jr. would constitute “an unwarranted invasion of personal privacy,” one of several exemptions included in state law. This is nonsense, as reading the definition of "an unwarranted invasion of personal privacy" in the Freedom of Information Law under §89 subdivision (2) will reveal. Another misused law school districts sometimes cite to withhold video evidence from the public is the Federal Family Educational Rights and Privacy Act (FERPA), arguing that disclosure of a video would be the release of a record with "personally identifying information" about a student because someone might recognize a student. At some point the public must demand that common sense prevails. There is nothing private about riding on a public school bus -- or about being dropped off the bus. If the Utica school district calls release of the video of a student getting dropped off an "invasion of personal privacy" then perhaps it should shut down its cable channel because they broadcast videos of students all day. The public can see through this. The school district could care less about personal privacy. What it is worried about is that the video may show malfeasance and expose the district to liability. YOU Just Knew It Made No Sense (2) . . . But the CORPORATION COUNSEL saw nothing wrong??? Nowhere in a state civil service guidebook is there discussion of different test levels, Utica Corporation Counsel Linda Sullivan Fatata said in defending the actions of the local Civil Service entity. “I don’t think anybody could foresee this,” Fatata said of this week’s determination by the state Civil Service Commission that LaBella took the wrong exam to become police chief. Ms. Fatata was probably thinking "I didn't think anybody would notice . . ."
Not to justify what Mayor Roefaro did, but politicians can be expected to look for loopholes through Civil Service laws if they are a roadblock to appointing the people that they trust. That's why we have Civil Service Commissions and Corporation Counsels -- people who are responsible for knowing the law and impartially applying it. If they are looking for ways to get around it, then they are not doing their jobs. City lawyers will convene next week and decide how to defend the appointment process to the state commission, Fatata said. But there is no defense. Applying two different tests with different requirements to the same position defies common sense. The list of people brazenly defending or excusing what was done grows longer and longer, and now reaches the Corporation Counsel's office. . . . revealing ever increasing depths of the corruption that permeates City and County government. The City Civil Service Commission must go, the County Civil Service Commission must go, and now the Corporation Counsel must go. They are not doing their jobs. You Just Knew It Made No Sense . . .
And now your suspicions have been confirmed in the OD: State: LaBella took wrong civil service test for chief spot. Daniel LaBella is eligible to be police chief … of New York Mills. But the Utica police chief is not authorized to hold the far more complex city police department position, the state Civil Service Commission determined Wednesday in tentatively rescinding LaBella’s appointment to the job. Why? Because the close friend of Mayor David Roefaro took the wrong Civil Service exam last winter, one for village-sized police departments, the commission said. This was blogged about here last June. At the time, it made no sense that the City could choose a chief from either a City test, or a far easier County test, both tests having different prerequisites. Where was the Utica Civil Service Commission when this was going on? County Personnel Director John Talerico said the city had sought to see police chief candidates from the county list. Puh-leese . . . The County knew better . . . Anyone with just a passing familiarity with the Civil Service system knows better. This particular appointment could not have occurred without County collusion. There is much more wrong here than meets the eye . . . it goes beyond Utica's borders and involves BOTH political parties. It also involves both levels of government. Someone from either the city or county civil service commissions should have thrown up a red flag about Daniel LaBella’s June appointment as police chief, according to a state spokesman. Yep . . . That's exactly what I said. Heads at BOTH City and County Civil Service Commissions need to roll. The public is not getting justice from these people. More of the Same . . . .
State officials offer some explanations: The Paterson administration wants to change the way New York businesses get tax breaks amid criticism that the Empire Zone program wastes public money without sufficient return in terms of economic growth. For Excelsior, there are tax credits for targeted industries – high technology, biotechnology, clean technology, finance and manufacturing. While tax credits are probably a necessary evil given that other states have similar programs, New York's problem with job creation isn't in its tax credit program . . . It is the way New York does business itself: too expensive, too complicated, too unpredictable. New York needs to start looking to its competition -- Texas, North Carolina, Tenesee, etc. -- and start bench-marking itself against those states. EG., How does the cost of transportation compare with Tennesee? You can cross TN on a free interstate, but New York charges a toll on its Thruway. That needs to change. Property taxes are probably less than half of ours in North Carolina -- How can New York change that? How does the cost of utilities compare? Why are our costs higher -- especially given our abundance of hydropower? If New York would make itself only "average" we would be way ahead of where we are now. Herbert Cully : Mr. Cully is the new Town of New Hartford Attorney. While allegations were made against Mr. Cully's firm, there are no indications whatsoever that Mr. Cully was involved in anything questionable. So why did the OD run the story with the negative headline implicating Mr. Cully? If only the OD had done some investigation of the prior Town Attorney's actions as Town Attorney and/or Republican Chairman, perhaps some of the trouble New Hartford finds itself in could have been avoided. There were certainly plenty of leads . . . specifically that attorney's invoices. . . .but the OD was hand's off. The lack of even-handedness suggests an agenda. Princess Lenska : The OD's latest "Polish Princess" smear was used to criticize the Roefaro Administration's economic development efforts, implying that they are a fairy tale. It is obvious that the OD has it in for this Mayor. . . . and criticizing his policies is fair game and what is expected of a newspaper. But why drag Princess Lenska into this issue? She invested a substantial sum of money in a Utica landmark with plans to turn it into something that would benefit the community. Instead of welcoming her investment the OD questions her authenticity. If the OD was sincerely concerned about Utica's economic development it would have applauded the investment. Again . . .What's the agenda? The OD pushes for windmills but doesn't seem to see their connection to power lines (which OD allegedly opposes). It was sort-of fitting that a few days later we read that NYRI was not giving up on its power line. Of course! . . . How else could the power of windmills reach the market? New Hartford . . . The wealthiest community in the area had to borrow to make payroll! WOW. Anyway, the New Year is off to a good start and there will be plenty to talk about. Thanks for reading. Never have so many people been so duped for so long, and at potentially so great a cost in dollars, lost freedom, and lost national sovereignty, as by those who insist that mankind's production of carbon dioxide (CO2) is causing “global warming” and that lifestyles must change to prevent a catastrophe. While, indeed, mankind has been known to cause ecological problems, global warming is not one of them. Nevertheless, even in the face of mounting evidence that “warming” is nothing but an elaborate hoax, those with an agenda are now going to Copenhagen to commit the U.S. to measures that will likely cost the average family thousands of dollars per year, destroy our economy, surrender a degree of self-governance, and cause unacceptable environmental impacts, all while producing a negligible effect on world temperature. The theory of global warming is simple. There are certain gases in our atmosphere which let solar energy in but not out, warming the earth much like the glass on a greenhouse warms the greenhouse's interior. CO2 is one of those gases, produced by every living creature that breathes, plant respiration at night, decaying organic matter, forest fires, emission from the earth's interior during volcanic eruptions, and people burning fossil fuels. Climate is primarily the product of solar radiation and water vapor – easily perceived with the change in seasons as the angles of the sun's rays change, and with the differences in temperature drop between clear and cloudy nights. Water vapor, by far, makes up most of the so-called “greenhouse gases,” and will never be in short supply given that seven-tenths of the earth's surface is covered by water. While the use of fossil fuels may increase atmospheric CO2, the significance of this increase in climate change is questionable because the role of CO2 itself is insignificant when compared with those of water vapor and the sun. Additionally, human activities account for less than 5% of the entire amount of CO2 that is emitted into the atmosphere. Climate change is real, is part of nature, is documented history, and is something we can discern depending on our age and location. From my recollection (which might not match someone else's), the hot summers of the late '50s and early '60s (remember the drought of '63 and '64?) gave way to the cool summers and cold winters of the '70s and early '80s. The heat came back in the '90s, but seems to be on the wane again in the '00s. History books record the coming and going of the dust bowl in the American Midwest during the 1930s. We learned in school about the Vikings' colonization of Greenland around AD 900 (something that would not be possible in today's cold temperatures) and the eventual abandonment of the colony within a few hundred years as the climate grew colder. The ancient Romans grew wine grapes in England in the first century which was, except for a period around the first millennium, something that was not possible again until recently. Any change in climate during the last 100 years seems insignificant compared to the change experienced by the Vikings – which was long before industrialization. Geologic history reveals even more dramatic climate changes. About 8,000 years ago, the Northern Hemisphere commenced what has been called the “Climactic Optimum” when temperatures were believed to have been a degree or two warmer than they are now. Not coincidentally, this was when human civilization began to develop. Before that, 18,000 years ago, vast ice sheets covered the Northern Hemisphere. Our area lay beneath 4000 feet of ice, which created our local landscape. The Hudson River carved a great canyon off New York City because sea level then was about 360 feet lower than it is now. A land bridge connected Siberia and North America, providing a migratory path out of Asia for the forerunners of our Native Americans. Mammoths, saber-toothed tigers, and other now-non existent animals walked the earth. Geologists tell us that the ice advanced and retreated four times during the Ice Age. Some geologists believe that we may still be in the Ice Age – that the present is merely a period of retreat – and that the ice will advance upon us again. In the light of this relatively recent geologic history, is the climate change of the last 100 years significant? The United Nations Intergovernmental Panel on Climate Change (IPCC) has expressed alarm over an approximate 6 inch increase in sea level during the 20th century. Divide the 360 foot increase in sea level since 18,000 years ago by the number of years and you come up with 2 feet per century. Since climactic optimum was 8,000 years ago, divide by 10,000 years and you come up with 43 inches per century. Assuming that humans do affect climate, is it even detectable against the natural background of sweeping climate change? Trust, however, is something that must be earned, especially when we are asked to take a substantial reduction in our standard of living. An expert's opinion is only as good as the data it is based upon and the soundness of the logic used to go from the data to the conclusion. Generally, the more data the better the conclusion. Data that does not seem to fit a pattern requires an explanation which can be tested. Soundness of logic is tested against one's own experience, as well as the experience of others. Experience includes use of the scientific method, employing multiple tests with only single variables to see if results are reproducible. A “consensus” of scientists on a conclusion is relevant only where the data and methodology have been made transparent to all. On “global warming,” however, there are simply too many indicators that “trust” is unwarranted. IPCC has relied heavily on the work of University of Massachusetts professor Michael Mann to justify world-wide control of CO2. Mann used various pieces of data and computer modeling to produce a graph, estimating world-wide temperatures for the past 1,000 years. It looked like a “hockey stick,” showing minimal cooling from 1000 to about 1900, then an abrupt up-tick in temperature to the present, coinciding with industrialization. In 2002 the graph caught the eye of Stephen McIntyre, a Canadian mineral exploration consultant, who had seen similar looking graphs used to attract investors. He suspected that certain pieces of data may have been emphasized over others to produce the graph's distinctive shape. Curious, McIntyre attempted to secure the data from Mann, but its location was allegedly forgotten (red flag). McIntyre discovered that IPCC did not verify Mann's work, nor had anyone else tried to reproduce the results (red flag). McIntyre teamed with Ross McKitrick and even though they eventually secured Mann's data and used his published methods, they were unable to reproduce Mann's results (red flag). They demanded that Mann turn over his computer program, but Mann refused (red flag). They eventually found a program used to process tree-ring data on Mann's computer server. After reviewing its code and plugging in data, McIntyre and McKitrick concluded that Mann had used an improper method because no matter what data was plugged into the program (including random “noise”) the “hockey stick” was the result. How many red flags are required to conclude that the “hockey stick” was nothing more than “GIGO” (Garbage In Garbage Out)? After much difficulty, their work was eventually published in the February 12, 2005 issue of Geophysical Research Letters. Skeptics are an important part of scientific inquiry because they ask the questions that need to be answered before a theory should acquire general acceptance and legitimacy. Acceptance of the theory of Continental Drift and Sea Floor Spreading (a/k/a Plate Tectonics) looked very different from what is seen now with “warming.” Skepticism was encouraged. Graduate students* would be asked to present the evidence both for and against drift to other students. Eventually, as more and more data came in, the “puzzle pieces” fit the “drift” theory best, and opposition simply went away. The “warming” debate, however, has a distinctly different tone. Contrary data is ignored. “Warmists” insist on no debate. They attempt to marginalize anyone who disagrees with their theory by calling them “deniers” and “idiots.” The tone and ignoring contrary data are more “red flags” that “warming” is not science, but politics. Recently, the “red flags” were confirmed in news stories out of the U.S. and U.K. that were under-reported in the media. In June, research scientist Alan Carlin, an EPA employee for 38 years, told Fox and Friends that he had authored a report critical of the U.N.'s position on global warming and had warned EPA that it needed to take its own look at the science. EPA officials suppressed his report and directed him not to speak to reporters about it. In November, two EPA lawyers, husband and wife Allan Zabel and Laurie Williams were directed by officials to scrub a personal internet video critical of “cap-and-trade” of any reference to the fact that they had worked at the agency. In late November in the U. K., a hacker (or whistle blower) broke into a server of the University of East Anglia's Central Research Unit and copied and posted on the internet data files containing hundreds of e-mails from a 10-year period among some of the most renowned climate scientists in the world – persons relied upon heavily by the IPCC to support warming. The e-mails revealed their measures to “cook the books” on climate data, discredit the scientists who disagreed with them, marginalize the scientific journals which dared to publish dissenting views, and destroy e-mail evidence of their collusion. What else is needed to prove that “warming” is politics, not science? “Warming” is also not about saving the planet or its people. If agreements on CO2 emissions are reached in Copenhagen and carried out, the impact to world temperatures will be speculative. However, compliance with an agreement will have clear adverse impacts to the environment. Coal-fired and even gas-fired power plants will likely be decommissioned to be replaced with wind-farms. Windmills are anything but “green” because they require maintaining extremely large tracts of land in a deforested state to implement. What is left of manufacturing operations will be driven to third-world countries, where more development will be allowed. Those countries do not have the environmental protections in place that we have. As reported on 60 Minutes a year ago, we already export discarded electronics to China, allegedly for recycling, but often winding up in poorly managed landfills. There they produce leachate, laced with heavy metals, which is poisoning people living nearby. Copenhagen would result in more of the same. Here at home we will be required to replace relatively inert incandescent light bulbs with supposedly “green” compact fluorescent bulbs. However, those CFLs contain mercury which will end up in landfills that some day will leak, creating poison problems for future generations to deal with. If “warming” is politics, then what kind of politics is it? In October Lord Monckton warned that the purposes of the Copenhagen treaty were to (1) create a world government and (2) transfer wealth from the West to the Third World. In November Herman Van Rompuy, in accepting his appointment as the first president of the European Union, said in a statement broadcast on the BBC that "2009 is also the first year of global governance with the establishment of the G20 in the middle of the financial crisis. The climate conference in Copenhagen is another step toward the global management of our planet."